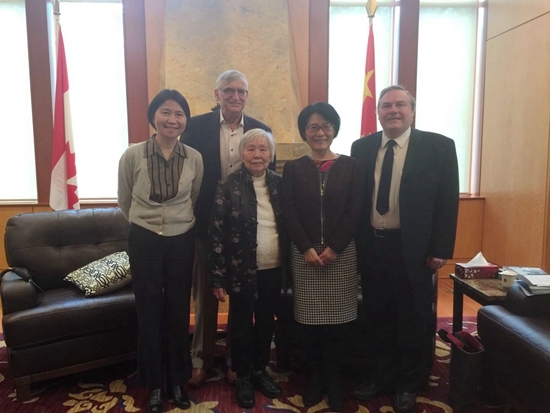 On March 13th, Consul General TONG Xiaoling met with Mr. Terry Raymond, Co-Chair of New Pathways to Gold Society(NPTGS) and its Directors, Mr. Don Hauka and Mrs. Lily Siewsan Chow. Representatives from NPTGS briefed on the endeavors and projects by NPTGS to build sustainable economies through the promotion of heritage tourism, First Nations reconciliation, and multiculturalism, showcased the major achievements of NPTGS including the recognition of sites with historical significance to Chinese-Canadians, together with the efforts from all sectors of the community under the support from the Government of British Columbia. They also recalled the touching story between First Nations and early Chinese immigrants. Consul General Tong recognized the achievements of NPTGS in the preservation and inheritance of Canada’s unique history of Gold Rush, diverse First Nation cultures, and the Chinese-Canadian heritage. Consul General Tong also pointed out the significant role of people-to-people exchanges and friendship as the bridge to the relationship between countries.